Confirmation is the third Sacrament of Initiation and provides an indelible spiritual mark on the soul, enabling a person to be a stronger witness for Jesus through a lifetime of worship, prayer, and service. They are marked with the character or seal of the Lord in such a way that the Sacrament of Confirmation cannot be repeated. 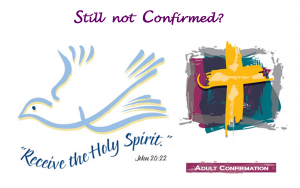 Any Adult (14 years of age and older) who has not been confirmed but wish to receive the Sacrament of Confirmation are encouraged to call the Parish Office at 330 385-7131. Confirmation for school age children please view click here or call the Religious Education Office at the number listed above. What is the role of a Confirmation Sponsor? Please view the Related Link to the right.